He has the distinction of being described as "The happiest man in Oklahoma" in a local newspaper story reporting on his return to flying after a 13-year hiatus enforced by the onset of diabetes mellitus. Michael Bilcik, from Yukon, Okla., says he is indeed happy to be once again medically qualified to solo because of a new policy implemented in December 1996 that permits diabetics to apply for third-class medical certification. He is the first Oklahoma pilot to be certified and one of sixteen nationwide who have reclaimed their pilot-in-command status. Late last year, after learning the "great news" that Federal Aviation Administration approval of the new diabetic pilot rule was imminent, Bilcik dusted off his flying skills with a flight instructor. Needing only ten hours' flight instruction to check out in a Cessna 172, he now has a cross-country flight to Austin, Tex., in his logbook. "The flying part was simple," he said. "It was the new airspace requirements that gave me the most trouble," he added, referring to the airspace reclassifications enacted in 1992. Bilcik says he has no trouble monitoring his blood glucose levels (he uses a Profile One-Touch meter) and that he has not encountered any difficulty complying with the new rules. Because he uses an external insulin pump and takes from eight to ten blood glucose sticks daily, his glucose level normally is at 80 mg/dl. The rules require that his glucose level be at least 100 mg/dl to be able to fly, so he says that he must adjust his insulin use accordingly. That, he says, has been the only "problem" encountered, thus far, of complying with the rules. "The pump is not for everyone," he warns, "because it requires strict monitoring." Thus, the eight to ten blood glucose samples per day. He uses Humalog (insulin lispro rDNA, manufactured by Ely Lilly), a rapid-acting human insulin produced using recominant DNA technology. Bilcik jogs regularly and enjoys an occasional round of golf. "Bottoming out" or being ketotic on his insulin pump has not been a problem, he says, because of his physical conditioning, regular monitoring, and motivation to achieve complete control of his blood glucose level. He plans to upgrade his pilot skills by taking flight lessons in a Cessna 210 (with retractable landing gear and variable-pitch prop). After becoming proficient in this and gaining the necessary flight time to upgrade further, well, "the sky's the limit," he says. Several media outlets have asked for interviews with the newly-certified private pilot. Why the interest in diabetics who would like to fly? 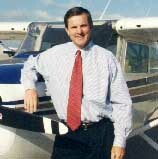 "It's got to be the greatest gift to someone who has lost the right to pilot an airplane," Bilcik stated. "There are many, many diabetics, former pilots, who would do almost anything to be able to get back into their airplanes and take off," adding with a smile, "I really love to fly who wouldn't be overjoyed to get their wings back?" And, who wouldn't be interested in learning about such success stories? Continuous subcutaneous insulin infusion with an infusion pump is an alternative to multiple-daily-injection therapy for achieving near-normal levels of blood glucose in diabetics. An insulin pump consists of a pump reservoir filled with insulin, a small battery-operated pump, and computer chips that allow the user to control exactly how much insulin the pump delivers. It is all contained in a plastic case about the size of a pager. The pump reservoir delivers insulin to the body by a thin plastic tube called an infusion set. Infusion sets come in various lengths and have a needle or soft cannula at the end, through which the insulin passes. The needle or cannula is inserted under the skin, usually on the abdomen. The process of putting the infusion set in place is called insertion, and is very much like giving a standard insulin injection. The infusion set is changed every two to three days. The pump is intended to be used continuously and delivers insulin 24 hours a day according to a programmed plan unique to each pump wearer. A small amount of insulin is given continually (the basal rate). This insulin keeps blood glucose in the desired range between meals and overnight. When food is eaten, the user programs the pump to deliver a bolus dose of insulin matched to the amount of food that will be consumed. The pump is not automatic. The user must decide how much insulin will be given. Using the results of frequent blood glucose monitoring, the experienced pump user can utilize the device to obtain excellent blood glucose control while living a normal lifestyle. Disetronic Medical Systems, Inc., USA- Minneapolis, Minn.